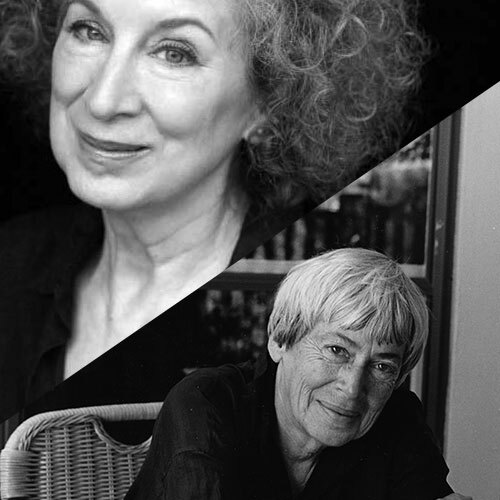 Longtime friends and accomplished writers Margaret Atwood and Ursula Le Guin share an open conversation about their writing processes. Ursula Le Guin begins her lecture with Margaret Atwood by saying, “I emailed Margaret about six weeks or so ago and said, ‘What are we going to talk about?’ and she replied, ‘I expect we will talk about 1) What is fiction? ; 2) What is science fiction? ; 3) The ones who walk away from Omelas—where do they go? ; 4) Is the human race doomed? ; 5) Anything else that strikes our fancy.’” The two women proceed to examine these questions and talk through their answers. They delve into their writing processes and motives, creating many humorous analogies for the act of writing, whether they connect it to naked chickens, salted slugs, or dark boudoirs. Margaret Atwood is a poet, novelist, short story writer, essayist, and environmental activist. She has written over 40 books and is best known for her fiction, including The Blind Assassin, which won the Man-Booker Prize in 2000. Atwood has used her public profile to advocate for human rights, the environment, and the welfare of writers. She has been president of PEN International and helped found the Writer’s Trust of Canada. As a public intellectual, Atwood is known as a brilliant thinker on a huge range of subjects who has a wry and ironic sense of humor and who is willing to call out platitudes and other forms of lazy thinking.